NBA's World Peace Gets Seven-Game Suspension For Elbowing Opponent : The Two-Way The basketball player formerly known as Ron Artest has been suspended for swinging his left elbow hard into the head of an opponent on Sunday. He'll miss the last regular season game and part of the playoffs. Is that enough? After Metta World Peace's elbow connected with James Harden's head, the Oklahoma City Thunder guard (behind World Peace) crumpled to the floor. He was later able to walk off on his own power. The basketball player formerly known as Ron Artest has been suspended for seven games for swinging his left elbow hard into the head of an opponent on Sunday. Metta World Peace, as the Los Angeles Lakers forward is now known, will miss the team's last regular season game on Thursday. The Lakers then move into the playoffs, where each round is "best-of-seven." So he could miss most or all of the first round (if the Lakers extend that matchup beyond four games) and even a game or two in the second round (if the Lakers advance after just four or five games). "This was not something that can be disciplined in seven games, not with Artest's history, not with Harden's injury. This was something that probably should have required twice that many games, forcing World Peace to miss the first two rounds of the playoffs and essentially ending his chance at making further valuable contributions this season." World Peace has apologized. He's now been suspended by the league 13 times, most notably for his role in the 2004 brawl with Detroit Pistons fans at the Place of Auburn Hills. 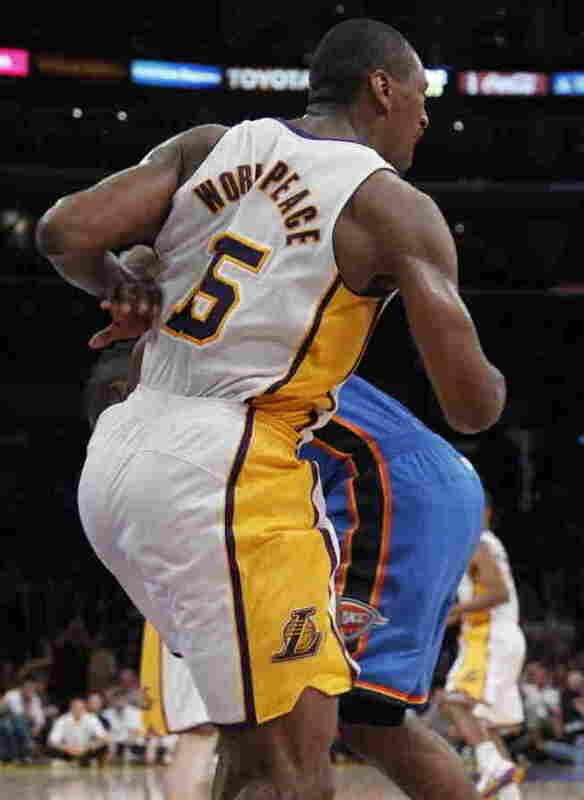 Is seven games a long enough suspension for Metta World Peace (Ron Artest)?